We’d love your help. 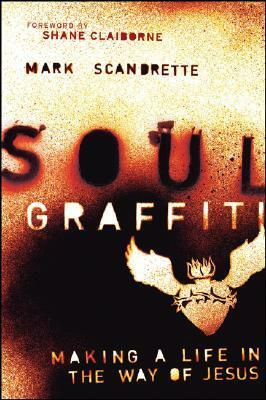 Let us know what’s wrong with this preview of Soul Graffiti by Mark Scandrette. To ask other readers questions about Soul Graffiti, please sign up. I haven't read this entire book yet mainly because I lived it. . . Well most of it. I wasn't alive for some parts of it, but for the greater part of it I was there. I am sure it is absolutely wonderful, because my Papa wrote it, it must be! The only part I didn't like was the part where Papa wrote, it took a lot of energy and he often stayed up past midnight writing, then slept for 4 or five hours and woke again and kept writing. I am so proud of him! I hope and expect that his book will change man I haven't read this entire book yet mainly because I lived it. . . Well most of it. I am so proud of him! I hope and expect that his book will change many lives, it definitely changed our family's. This book is meant to expand your understanding of what it means to live a life in Christ, and to challenge you to find ways to put that understanding in action. The first task is attempted in the actual text of the chapters, which comprises 90% of the book. The task might be accomplished if you are a brand-new Xtian or legalist (and legalists would not read this book). For the rest of us, we end up reading some anecdotes that highlight how cool and accepting the author is (despite being a Christ This book is meant to expand your understanding of what it means to live a life in Christ, and to challenge you to find ways to put that understanding in action. The first task is attempted in the actual text of the chapters, which comprises 90% of the book. The task might be accomplished if you are a brand-new Xtian or legalist (and legalists would not read this book). For the rest of us, we end up reading some anecdotes that highlight how cool and accepting the author is (despite being a Christian! ), and how wise. He summarizes past conversations by quoting them, but then the quotations say things that no person would say in real life. That leaves you wondering whether he made it up, or is sprucing it up for a written publication. If it's the first, it's bad fictional dialog; if the second, it's needlessly pretentious. His anecdotes are all the same, too, while trying to show how different they are and how well they point to deep spiritual truths. They all involve him, and he's doing something new and quirky and edgy and outward-oriented, meeting new people, hanging out with people outside of his class, even crazy people. Shocking! Just like Jesus, how brave! If this blatant self-aggrandizement were all the book offered, you would have seen 1 star. But occasionally he brings up new concepts, a few of which I strongly agree with (and take for granted, but was glad to see someone write down). And many, many of which I disagreed with, and which he made no attempt to convince me of. More specifically, made no attempt to relate to readers unlike him, and convey his message in a way they would be open to. Still, several interesting ideas was a good change from the anecdotage. I guess we'd still be at 1 star, except for the 10% of the book that is aimed at the second task of challenging readers to act on their non-legalism and find ways to live deeply for Christ. The author still shows his personality bias (he's into art, music, the lyric, beauty, life, love, fruitiness-general, remembering to foster your inner world [as opposed to doing it naturally]) in what he recommends we experiment with to live for Christ, and I didn't like that. But ultimately this part of the book is better. I support his call for experimentation, for one thing. And I like that he often asks the reader to find something related to what he said in the chapter, something that fits them, and wrestle with an idea or try living something out. This is good, and I got a couple of ideas from the end-chapters, and am better off b/c of it. Others like me who know how they should be living and need periodic nudges to get out of ruts, but better than me b/c less critical, may get lots out of it. For that reason I would have gone to 3 stars, except the writing wandered all over the place, discursing on this idea then that anecdote, and finally a major point at a random place in the chapter, then suddenly, end of chapter. Badly organized. Like my book reviews. I don't know if you would call Scandrette a "theological artist" or an "artistic theologian," but the merging of the two disciplines (art and theology) makes for an incredibly refreshing perspective in this book. And given his competence in both areas, he achieves a winsome tone while addressing issues of serious profundity, resulting in some very compelling reading. Scandrette has a way with words that makes the book read like poetry at times (sometimes actually using poetry) and like an engagi I don't know if you would call Scandrette a "theological artist" or an "artistic theologian," but the merging of the two disciplines (art and theology) makes for an incredibly refreshing perspective in this book. And given his competence in both areas, he achieves a winsome tone while addressing issues of serious profundity, resulting in some very compelling reading. Scandrette has a way with words that makes the book read like poetry at times (sometimes actually using poetry) and like an engaging memoir at other times. His penchant for story-telling and the compassionate humanity illustrated in how he speaks of his family and neighbours draws the reader in to want to count him as fellow pilgrim in the journey of life. Or at least to strive to have the same character and perspective on that journey. Scandrette's essential message? There is a way to be fully alive, fully human. It is found not in religious formulas or sub-culture. Nor is it found through an unhealthy preoccupation with escaping to the afterlife. Instead, it is found by making a life in the Way of Jesus. "This book is divided into four parts that correspond to four phrases from the introduction of the Gospel of Mark . . . Part One explores the context from which we encounter Jesus as a messenger. Part Two addresses issues about how we relate the 'good news of God' to our time and place. Part Three investigates how the sacrifice of Jesus is related to the message of God's reign. And Part Four discusses how we might respond to the invitation to 'repent and believe the good news.'" That's about as structured and "text-booky" as Scandrette gets. The rest of the book is full of engaging mini-narratives that explain his points. With those stories, he beautifully, and often poignantly, illustrates the way in which he is striving to make his own life in the Way of Jesus. We read this book with our College Book Club this summer and they were all a huge fan of it. I thought it was a really great and totally accessible for the students. One thing I particularly enjoy about the book, was that it had discussion questions and "spiritual experiments" at the end of each chapter. So it worked perfectly for our use. I would highly recommend this book to anyone - especially to be used with college students, young adults, or even as a church-wide book study. I love the experiments and thought provoking questions at the end of each chapter. Meaningful application, artful expressions, and moving stories make this non-fiction book a must-read for those seeking to follow the way of Jesus. LOVE LOVE LOVE. Fresh ideas on how you do faith. Great concepts and perspectives. The writing felt a little disjointed, but it was so refreshingly open-minded!